Three big screen TVs, thirteen plasma screens and a 3D area. until 18:00 only on weekdays. What did you think of Famous 3 Kings? F3K is the best bar I've been in to watch the footy. More or less every game is on simultaneously in one part of the bar or another. Well organised and friendly. This place cannot be beat, so I often travel across London to watch footie at the F3K. Sports bars often carry the connotation of cheap alcohol, a sterile environment and OTT crowds. It’s enough to strike fear into any fans of a ‘refined’ drink. Still, if you can’t afford the Sky Sports fee or just want to enjoy a pint while cheering your team on to victory (or otherwise) the Famous 3 Kings is a decent place to do so. Famous 3 Kings is far prettier than your bog-standard sports bar. 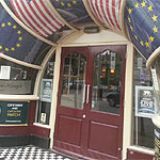 It’s located within a beautiful corner-positioned building that could easily be converted into a grand old traditional pub. However, once inside, those borderline-tacky sports bar touches have crept in. 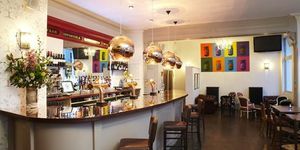 The oversized TV screens hang from plain walls, flags and sporting memorabilia can be spied all over the place and the bar, tables and chairs are shiny and sterile. Although the bar has tried to instil some comforting decorative embellishments like exposed brick and granny lamps, it’s just a bit bland. That said, with over a dozen big screens across different areas and rooms and with a downstairs games room, the bar has really pushed the boat out when it comes to entertainment. 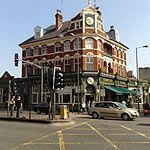 When a big game is on – particularly a key footie fixture – the atmosphere at the Famous 3 Kings is electric and this pub really comes into its own. The bar really excels with the choice offered to punters, and if there are two or more big games on – not uncommon – then different screens will show different events so you’re not left calling around any pub within a 5 mile radius just to see your team win. And the crowd is pretty good, with little attitude – this is Kensington, after all. Famous 3 Kings has kept to the sort of menu that has made Wetherspoons so popular –greasy, stomach-lining grub. The menu is colourful with pictures of the food (in case you’re not sure what a burger looks like) and you can order things like a rather overpriced ham sandwich for £5.75 or a jacket with beans for nearly a fiver. The mains are much better value, with dishes like steak and ale pie with chips or chilli coming in at under a tenner. Make the most of food deals such as two main courses for £11 to keep the costs down. Given that beer is such a focus when the footie is on, Famous 3 Kings doesn’t really push the boat out with its selection. You’ll find a decent choice of common lagers like Heineken, Fosters and Peroni alongside traditional draught favourites Strongbow and Guinness. There is, however, unusual Welsh ale Brains, which is usually difficult to track down in London. If beer isn’t your thing (gasp!) then there's a large wine menu comprising a selection of cheap bottles of plonk - we’re talking £10 a bottle. 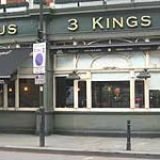 If you’re looking for a sports bar with decent screens that’s large enough to hold you and your mates then the Famous 3 Kings is as good as any other sports-focussed bar in London. How much you’ll enjoy yourself probably depends on whether or not your team is winning. I love this pub. If you are Welsh and want a great place to watch the rugby outside of Cardiff, then this is the place to be. They have Brains on tap and the food is good. It gets VERY busy on match days, especially during the Six Nations, so you need to get there early to avoid queuing outside. However, for atmosphere and for Welsh people living in London, it can't be beaten. You don't have to be Welsh to come here however, you often see the odd Scot,Irish or English rugby fan too, and there is never any trouble. I only ever come here to watch Wales rugby matches so I can't comment on what it is like at other times of the year, but every time I've been I haven't been disappointed. Don't go for Big Match build up.. Unless u want to listen to Kareeokee over tactics lol. You're better off being drunk by the time you get there, service takes ~15minutes, terribly short staffed on busiest day of the year.. Great venue, needs better management. It's not a venue for football fans. It's for Rugby fans and #those who take a passing interest in sport. There was no atmosphere in the place, there was no pre match build up and there was loud music being played over anything else. Furthermore the manager thinks it's a wise idea to do a karaoke things too? Why did he say incompressible nonsense on the mic which wasn't important nor relevant. Wtf? When questioned then claims he knows what's best, i. E. To be playing cricket on the big screens 30minutes before the champions league final?. Service is soooooo sloooowww! Biggest match of the season and manages to screw it up completely. The manager is incompetent and does not run the pub well. Drinks are over priced and the food was late and cold. Venue itself is alright, I liked it, but the management makes it a very very very poor place Tf * rating. If u like sport with prematch build up, commentary statistics analysis, i. E. All things associated with the match, or ifu like your sport with sound then i'd really suggest you go elsewhere. Just go elsewhere peoples, not worth going there at all. fantastic and friendly bar staff . Everyone is entitled to their own opinions, mine is that this pub is fantastic for watching any major sports game. Saw Wales beat Australia here and I have been back more recently to watch all the NFL games you just can't beat it in London for atmosphere and the beer is not to bad. Staff can be quiet sometimes but that is not to bad a thing. All in all, if you want to watch football, rugby even european basketball I've seen here check this place out. Peace. Nice enough place on the inside and so easy to get to being right next door to the tube station - more of a Bar then a pub However be very careful about ordering a soft drink there - they totally fill up the entire glass to the very top with ice first and then pour in the soft drink - by far the most watery cola I've had in London in years and quite expensive. So using the words "No Ice" before every order is very important here. Also their overhead signs says there are two for one deals available everyday and when we went there at 6pm on a Saturday - there was a single sheet of A4 paper just printed off with a very short list of food available saying sports day menu. The pub is known for showing sports all day, everyday so this could be a permanent menu for all we know. The burger and chips tasted good and was served in quite a nice space saving plate. However the quickly done up menu didn't explain it contains bacon, etc in it either which Jewish or Muslim customers especially might appreciate to know in advance before placing their orders..
Also the wait to be served is very long. When we went there it wasn't all that busy - just 6pm on a Saturday with no major games happening but the staff that were there took forever to serve you and when they did you had to repeat your order several times as they were not native speakers of English, so you struggled a bit to get your order in. Have been coming to f3k for a fair few years now on and off, had to bite my lip a few times when here to get the guy to shut up on the mic. Was in for the FA Cup final and good news, new manager no Microphone, was able to listento John Motson without added commentary. Happy days. All that the F3K's is famous for is making you stand outside the pub (like school children waiting to get in to a funpark), be4 any major football or rugby match. What's that all about? If the pub is open then why make us customers stand outside till 5 mins before the game, even though the whole place is empty. The F3K is the most amazing place to be, outside of Wales, when the rugby is on. I had a fantastic day when Wales played Australia in 2006, and the landlord really gets the crowd going and the staff are really friendly. Plus, they serve Brains Dark on match days at the F3K. Fabulous day at the F3K - England v Wales Rugby 20th March 2004 - great atmosphere - loads of people - loads of screens - good use of the microphone by the landlord to get everyone into a frenzy - a close second to being at the Millennium Stadium on match day! Luverly jubberly!